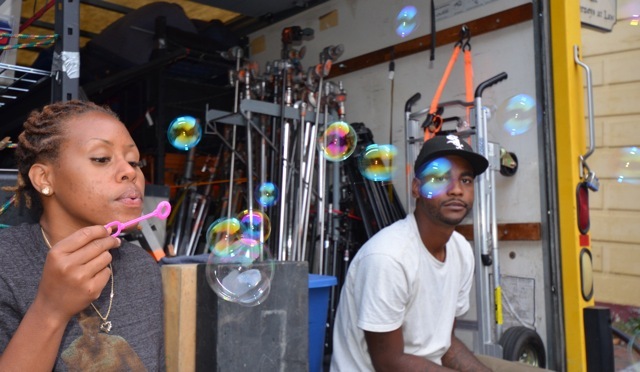 Monica Hunter blowing bubbles while Devin Lewis watches as they guard the equipment truck in Shepheredstown. Holly Siders watches as Rob Zeman adjusts a light for the night filming at Trish Bragg's old house. Michelle Farrell, left, watches with Drew Loughlin and Devin Lewis. JEANIE CLARK-DIRECTOR AND PRODUCTION MANAGER Originally from the Pittsburgh area, Jeanie Clark is an award-winning East Coast filmmaker and founder of Steel Corset Productions. She is best known for her romantic comedy, Smalltimore, (Best Director, Indiefest 2009). Other awards include the Judith Rheiner Award for Independent Spirit (The Red-Headed Menace, 29 Days Later Film Project 2009), and the Baltimore Creative Alliance Movie Makers Fellowship (2011). MICHELLE FARRELL-DIRECTOR OF PHOTOGRAPHY Videographer on two dozen independent movies. Winner of multiple awards, including the Bronze Peer Award winner International Independent Film Festival. HOLLY SIDERS-ASSISTANT DIRECTOR Holly's feature length script, My Autopsy, won second place in the screenplay competition at the 2011 Appalachian Film Festival and was also an Official Finalist at the 2011 Beverly Hills International Film Festival held in Beverly Hills, California. It also won a Silver Ace Award at the 2011 Las Vegas International Film Festival and the Award of Excellence at the 2012 Canada International Film Festival. MARIAN DEALY-GAFFER/ELECTRIC After earning a PhD in Genetics at UC San Diego, she went to the NY Film Academy and became an accomplished filmmaker. Doing every job except sound: cinematographer on seven films and camera/electric on eleven. She also plays compe`titive ice hockey. MEGAN REED-ASSISTANT CAMERA Responsible for perfect focus, Megan has a degree in Interior Design and Architiecture. She has worked on seven films, and aims to work in set design. ROB ZEMAN-GRIP AND SWING He edited the superb trailer for the website. A graduate of Towson University, Rob directed the valley fill scene and shot of Theresa starting college. He has dozens of videos on his YouTube channel, RZeman. NATE SPIVEY-KEY GRIP He was always prepared. When batteries were dead on Michelle's two cameras, Nate pulled out his own camera to film mining on the flight with Scott Carpenter (Judge Haden) Also a Towson University graduate, Nate has worked on nearly a dozen films and is aiming for higher-end grip and electric work on films. DEVIN LEWIS-GRIP AND SWING Another Towson University graduate, Devin partners with Torian Tarrant in Live Free Films. They have produced short films, music videos and promotional videos. 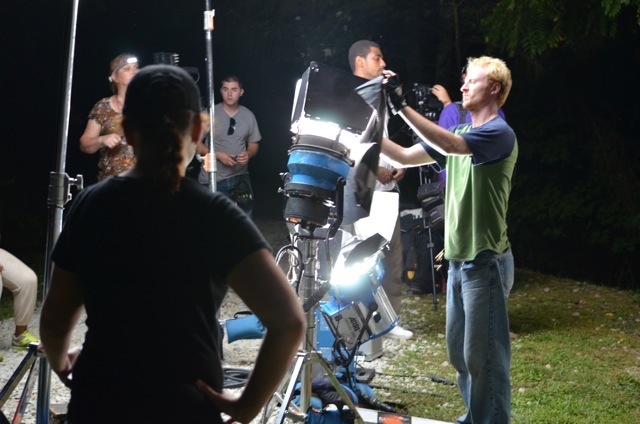 TORIAN TARRANT-SOUND A Stevenson University graduate, Torian has done a bit of everything: camera, assistant director, editor, electric on more than half a dozen films. Partner with Devin Lewis in Live Free Films. DREW LOUGHLIN-SECOND ASSISTANT CAMERA/DOLLY GRIP Drew has worked on films since he was 18. This was his first feature, and he would like to do more camera work. MONICA HUNTER-INTERN/GRIP Michelle met Monica at a charity event and invited her to join the crew, and Monica says: "I met these kind, loving people." PAUL DINH-MCCRILLIS-CASTING DIRECTOR/PRODUCER- Casting director/associate on a dozen movies and TV shows, including The Angry Klown, Wanted, Introducing Lennie Rose, and Little Chenier. PENNY LOEB-WRITER/EXECUTIVE PRODUCER Journalist for more than 30 years, at Newsday and U.S. News & World Report. Numerous journalism awards, including finalist for both the Pulitzer Prize and National Magazine Award. Wrote prize-winning book, Moving Mountains: how one woman and her community won justice from big coal. 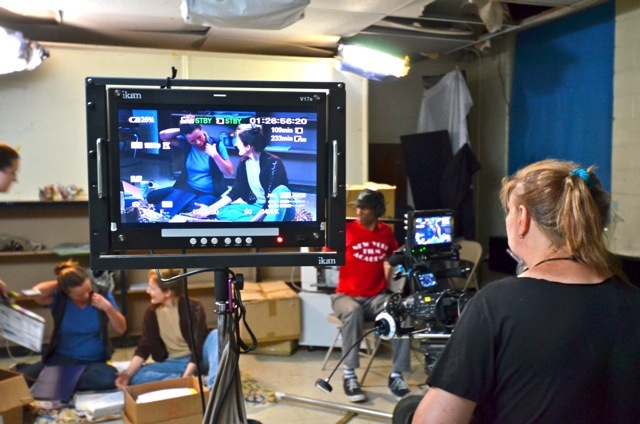 Michelle Farrell sets up a shot of Theresa Russell and Tina Alexis Allen as Torian Tarrant tests the sound. 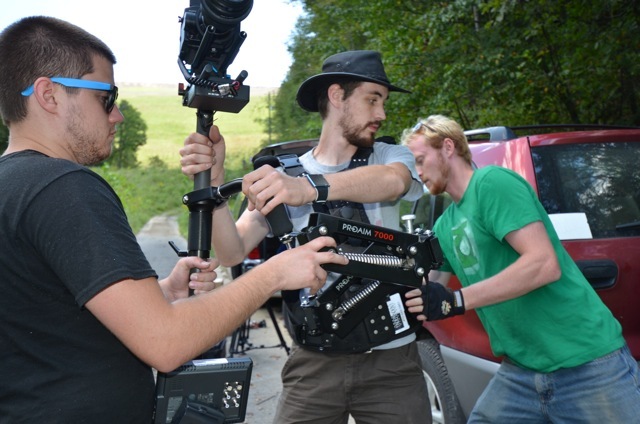 Rob Zeman, right, and Drew Loughlin adjust the equipment on Nate Spivey for the special shot of the valley fill. It's a Wrap! 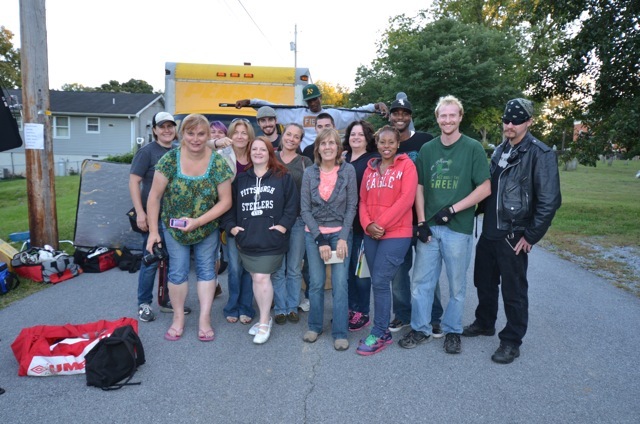 After final scene was filmed in Shepherdstown: (from left): Marian Dealy, Michelle Farrell, Megan Reed, Tina Alexis Allen, Jeanie Clark, Nate Spivey, Theresa Russell, Torian Tarrant, Drew Louglin, Penny Loeb, Lisa Bragg, Monica Hunter, Devin Lewis, Rob Zeman, Dustin Tichenor.